Anyone look over the new delta saw? They sell it at lowes. Looks pretty interesting. I did take a look the other day. The undercarriage had a lot of aluminum, although they look beefy... The machining underneath looked good, and the dust collection should be great due to it having a shroud right around the blade. The fence is essentially a t2 fence....so it should be an improvement over the ridgid 4512 fence. The weight is considerably less than comparable saws, good for moving it....bad for stability. All in all....looks like a winner to me and a huge improvement over the porter cable lowes had been carrying. Even a decent circular saw is 15 amp. OH, wait a minute ... .........Yep!.............That's what he said! Not really a fair comparison to compare an induction motor to a universal motor. I'd take a 13 amp tablesaw over the 15 amp circular saw anyday. If a 13 amp motor is equal to about 2.1 hp (I read that somewhere), and a typical outlet only let you put out about 1 1/2 to 2 hp @ 110 current, what good is more hp? The noise level difference is a big plus. I am considering upgrading from my dewalt 744. A cabinet saw is too heavy to move around, so compairing these different ones, like Sears contractor saw to this delta the pros and cons. The pros and cons really probably come down to a pretty small list. Dust collection....craftsman has 4 inch port, delta has blade shroud. Fence rails - both split rails, but delta easy to swap out to single piece from metal supply house....not possible with craftsman. The two are pretty darn tight competition if you ask me. Looked at one at lowes today. The t square doesn't line up very square to the miter slots. I take it that's a assembly problem though I am not sure how you fix that. The steel side tables were set up a little high, I know that's assembly. Other than that, it looked really good. There's adjustment screws on the fence to square it to the miter slots. Are you calling the miter gauge a "t square?" That should be easy to fix or just buy a better gauge. No, I was talking the t square fence to the miter slots..
Hi everyone. New guy here. After reading all reviews about this new table saw from this forum and other sites, I decided to buy this as my first table saw. What made my decision were first, the closest HD that carries the Ridgid R4512, the other TS I was interested in, was about 1.5 hours away. Second, even though the Delta cost a little bit more than the Ridgid, I would've spent the difference in gas driving to HD since I drive a Hemi Durango. Third, Harbor Freight is currently having a President's Day sale this weekend offering 20% off for an entire purchase if you spend $100 or more. Since I've read online about using HF coupons at either HD or Lowes with some success, I thought I'd give it a shot. I stopped by Lowes yesterday, Friday, afternoon to inquire about using the coupon. I was told only the manager can give me an answer, but he'd already left for the day and was told to come back the next day. So I returned this morning looking for the manager and was told he was off for the day. But I went ahead and ask the guy if Lowes would accept percent off discount from HF. Before I even finished my question, he had already said no problem. In my inner voice, I was like hell yeah! He just told the cashier to give me 20% off for the saw, didn't even have to show the coupon I had on my phone. After he did the price override and left, I showed the cashier my military ID and I received an additional 10% off. My inner voice did another, he'll yeah! I will assemble the saw tonight and I'm going to post my assembly/setup review of this saw. Let us know what you think of it, good to hear you got a good deal. Has anyone confirmed that the trunnions can be adjusted to align parallel with the miter slots for this saw? I keep reading about people who've found them in alignment out of the box, but no manufacturer has been able to permanently overcome the potential alignment issues caused either during transit or at the factory itself....sooner or later someone's going to need to make a trunnion adjustment. I have been trying to decide for a while now between this Delta, the Craftsman 21833, and the Ridgid 4512. There really doesn’t seem to be a lot of reviews for the Delta. The Craftsman and Ridgid both seem like good saws for the price but I’m concerned with the much written about alignment issue. I was hoping to eventually see reviews on the Delta that specifically discuss blade alignment at different blade heights which is supposed to be the issue with the other two. I am sure that I could be happy with any one of the three if I was lucky enough to get one without any issues. Hopefully more info will soon be available for the Delta and I’ll finally make my decision. There aren't a lot of reviews as it's been on the market for only about 3 months. The craftsman and ridgid don't seem to have the alignment issues anymore. I think they've fixed it. Alright fellows, I finished assembling the 36-725 thihaven't morning and it took me about 6 hours total. Don't laugh, it's my first table saw and I'm very meticulous. The part of the assembly that took a while for me were installing and aligning the front/rear guide rail assembly. As you all probably know, it's a split rail. If it was not, it would be a lot easier to install. In addition, when I was aligning the fence, I had to realign/adjust the left portion of the guide rail because when I moved the fence left of the saw blade or when the fence was on the split, the fence was not parallel to the miter slot. But after 30 minutes of adjusting, I was able to get the fence parallel to either miter slots and throughout the entire rail. Ok, about the saw blade alignment. When I checked if there was a discrepancy between different blade heights, there was none. But when I checked the blade alignment from front to back, the front was approximately less than a 64th of an inch further from the left miter slot than the back. I'm not even going to try to adjust the trunnion to align the blade further because for me, I think it's good enough. Again this is my first table saw, so I'm not a pro at this yet. Other than the one blade alignment issue, everything else checked out good. I did replaced the stock blade with a Diablo 50T combination. The only bad thing about doing this was I can't use the riving knife because it's thicker than the Diablo blade...thus will not be able to use the anti-kickback and blade guard because both attaches to the riving knife. I'm going to buy another blade so I can utilize all the safety stuff. I've read a lot of comments about this saw being about 50 lbs or so lighter than the Ri dgid R4512 and may not be a stable saw, well it is. I don't have a perfectly leveled garage floor but the adjustable feet levels the saw. I haven't tried to rip a full sheet of 3/4 inch MDF so I can't tell you if this saw will be stable enough but I did do the push test and the saw did not budge. Rollers worked as advertised. The other thing I liked about this saw is how quiet it is. It just hummms. I tested the saw by cutting half inch Birch plywood for my zero clearance inserts since there are currently no zci available for this saw. No issues cutting plywood. After I'm done fabricating my zci, I'll start making my crosscut sled, push sticks, etc. Overall, I'm very happy and impressed. 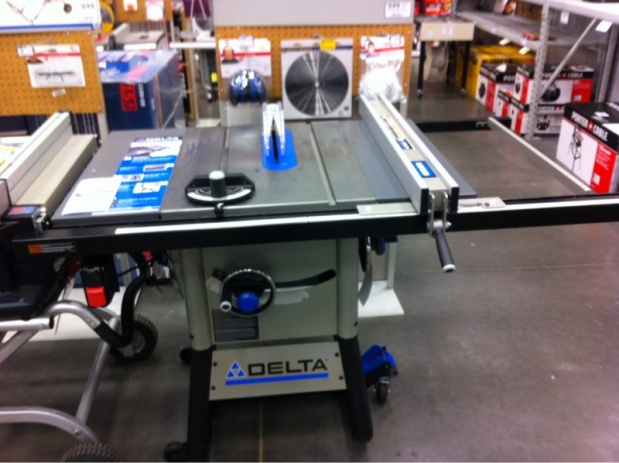 I looked this saw over at my local Lowes and the one they had on display seemed to be assembled fairly well. I likes the safety features but you can not use a thin kerf blade with then. The under side looked pretty Beefy even though it was made of aluminum. The display model was ease to roll and was rock solid when the front wheel was lowered and the saw sat on the legs. I have the Rigid Wheel set on my Craftsman (I forget what its called but its the same lift and rollers that come on the Rigid TS) and the Delta is a lot easier to move than my Craftsman. I think Delta has a winner here, but I'll wait until its been on the market longer before writing the check and bringing one home. If Woodworking is so much fun why isn't it called WoodFUNNING? I found it AFTER I bought a T2 fence for my bosch. Talk about annoyed! Looks great, I think I may get it when I move to ft Bragg, but I'll have to sell the wife on it.